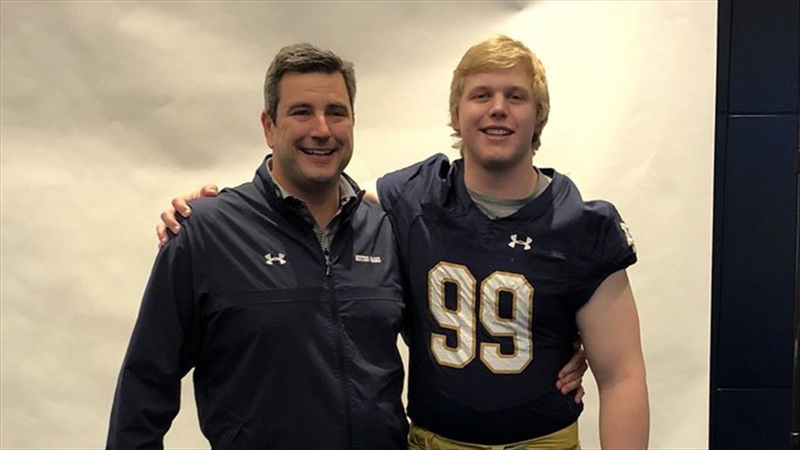 2020 Lake Forest (Ill.) defensive lineman Rylie Mills‍ was one of the headliners on Notre Dame’s loaded official visitor list. For the four-star prospect, this visit was about more than just seeing the campus and practice. Mills wanted to get a few questions answered and Notre Dame hit a home run. “It definitely answered a lot of my questions,” Mills told Irish Sports Daily. “The biggest thing I wanted to find out was what it was like being a teammate, being at school around the guys and just the in’s and out’s of the team. Doing this official visit answered a lot of the questions. Spending time around the team was a significant part of what Mills wanted to experience as he’s been around a close-knit team at the college level before. Mills was able to spend time with numerous players from both sides of the ball over the weekend and each player made a positive impression on the 6-foot-5, 275-pounder. The official visitors spent Saturday night at Brian Kelly’s lake house and it offered a chance to spend time one-on-one, but also to see a lighter side of the Notre Dame head coach. Defensive line coach Mike Elston spent plenty of time around McGregor and Mills this weekend, but maybe the most impressive thing for the Lake Forest star was seeing the same guy he first saw at a summer camp. 2020 Notre Dame defensive line commit Aidan Keanaaina‍ admitted he wanted to be attached to the hip of McGregor and Mills this weekend and it was a positive move. “I liked Aidan a lot,” stated Mills. “He didn’t push anything on us. It was more about getting to know us. I think Aidan is a really good dude and I liked being around him the whole weekend. His message was about his decision because Notre Dame was the best thing for him. The three defensive linemen had spoken before the visit, but the chance to hang out for a weekend could end up being a significant move for Notre Dame. “The whole recruiting trip we were all together,” explained Mills. “It was cool to be with them. We all have a good relationship. Braiden and I got to hang out one of the nights. I liked Braiden a lot and I think it was nice to have that relationship. Mills will now head to Ohio State and Wisconsin for official visits before taking some time off in May. He could take two more official visits, but he could also have a decision in June if it feels right. “I’m going to take a couple more visits and after that, I’ll have all the information I really need,” said Mills. “The biggest thing I wanted to know was more about the team and that’s a big part of the official visits. I’ve seen most of the places I’m going to, so it’s about the team and kids I’ll be playing with.